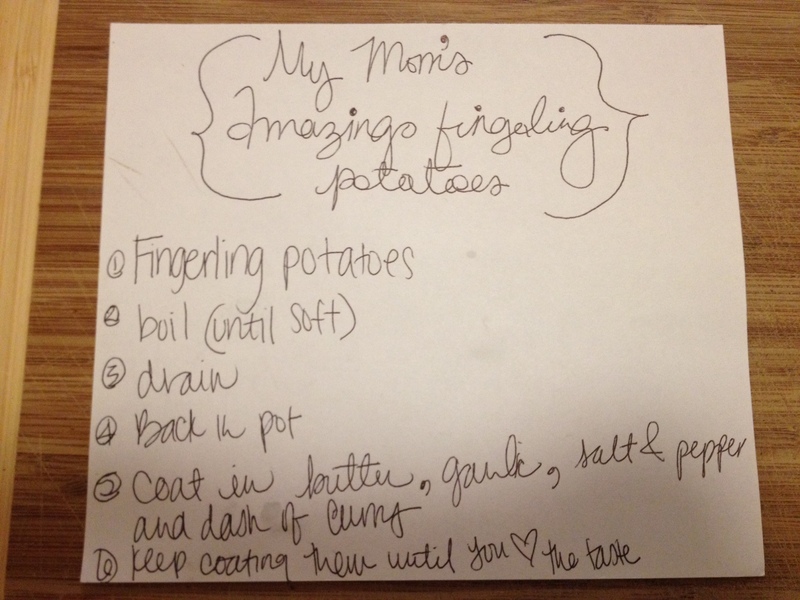 Recipe: My Mom’s Amazing (Melt-in-Your-Mouth) Fingerling Potatoes | mrs. and the misc. ← Happy Weekend from the Mrs. 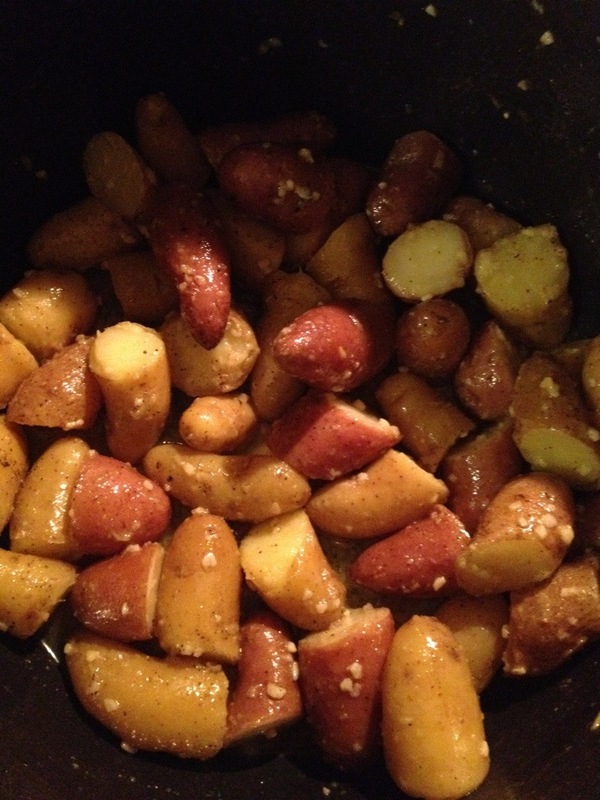 Whenever my mom visits me in Little Rock, she makes me her amazing fingerling potatoes. Last time she was in town, however, we had no power because our city was besieged by an ice and snow storm. So, I was unable to savor her potato greatness. Of course, now that I’m on my diet and exercise program and am avoiding carbs as much as possible, I am craving them like crazy and can’t have them. But you can! 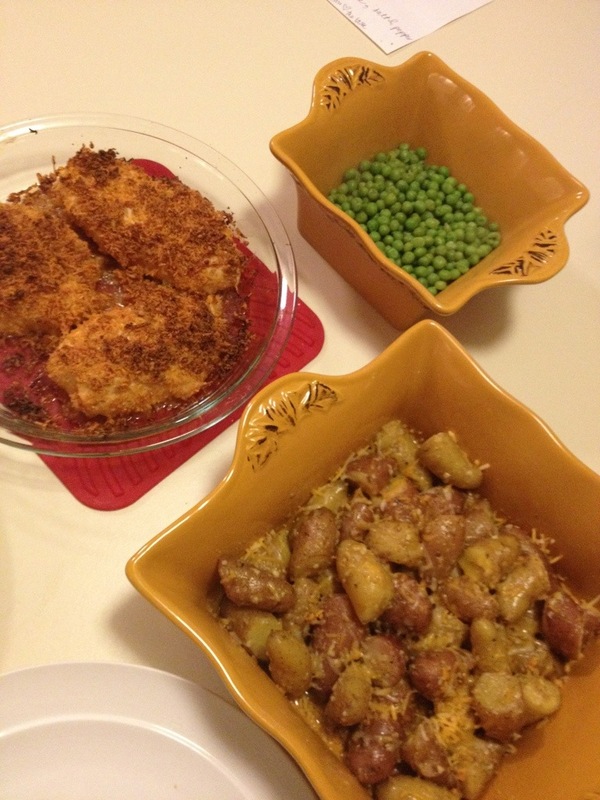 Here is my mom’s recipe – one of my favorite side dishes for beef or chicken dinners. Pretty easy…should only need my pictures to be able to make it yourself. Enjoy! I bought a bag of mixed fingerlings and cut them into halves and thirds depending on their original length to make nice bite-sized pieces. 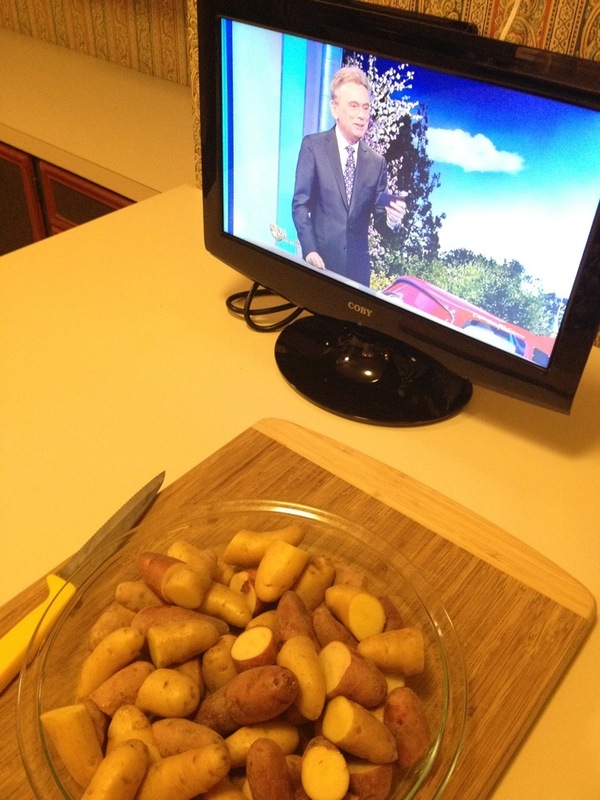 I enjoyed doing this in front of my new kitchen TV, which my mom bought me for xmas! Seemed appropriate. 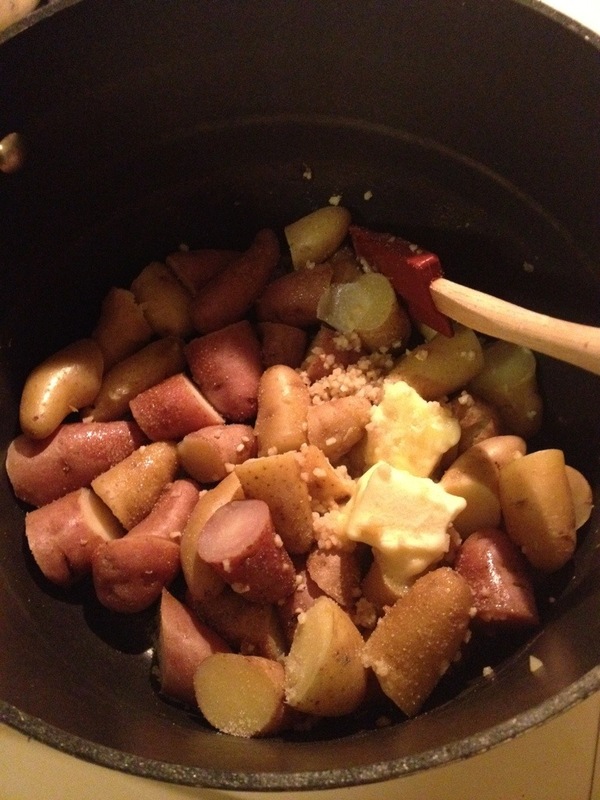 Stir in minced garlic and butter. Don’t be shy with either ingredient. Also, season with salt and pepper to taste. 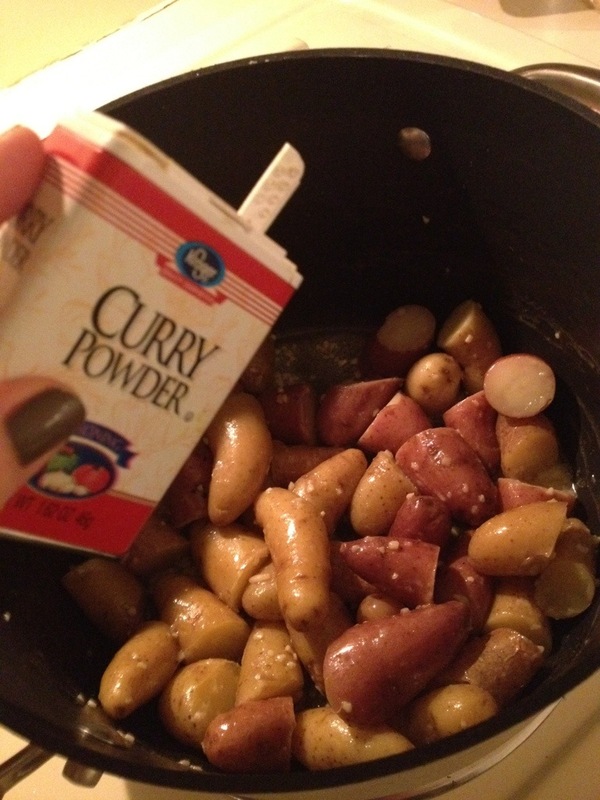 My mom has always said that adding a dash of curry makes almost everything taste better. 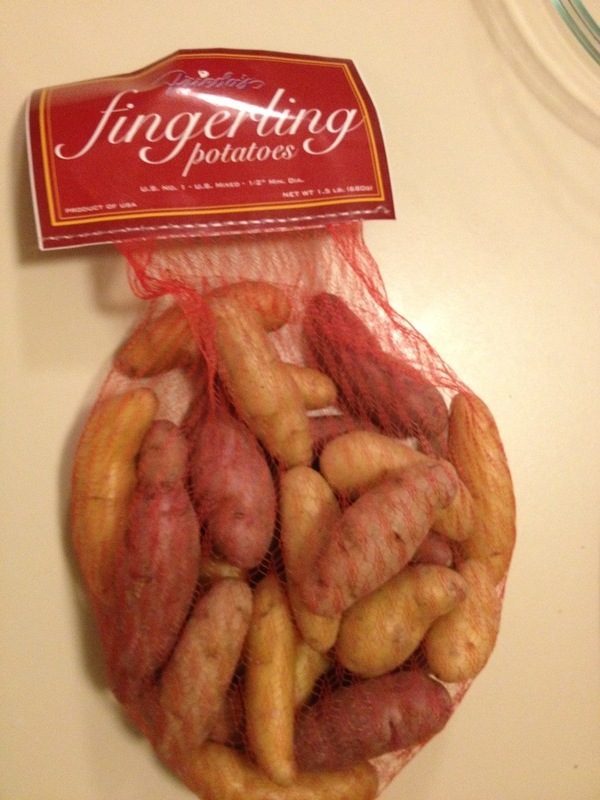 These fingerling potatoes are no exception! Mix until the plump little pieces are soft, buttery and delicious. 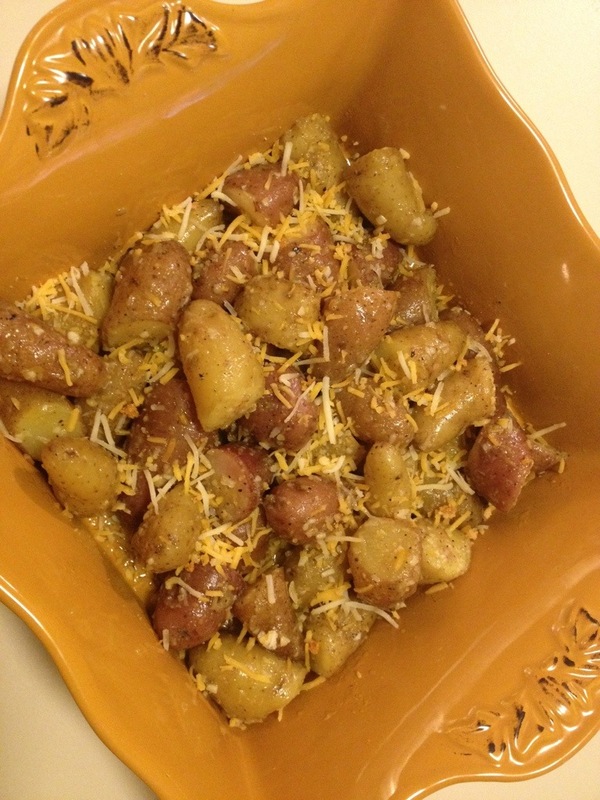 Sprinkle with grated cheese, and watch it melt scrumptiously over the hot, buttery potatoes. I served mine, ironically, with peas. (My mom hates peas). PS: I served KRAFT Fresh Take Southwest Three Cheese chicken with the meal. 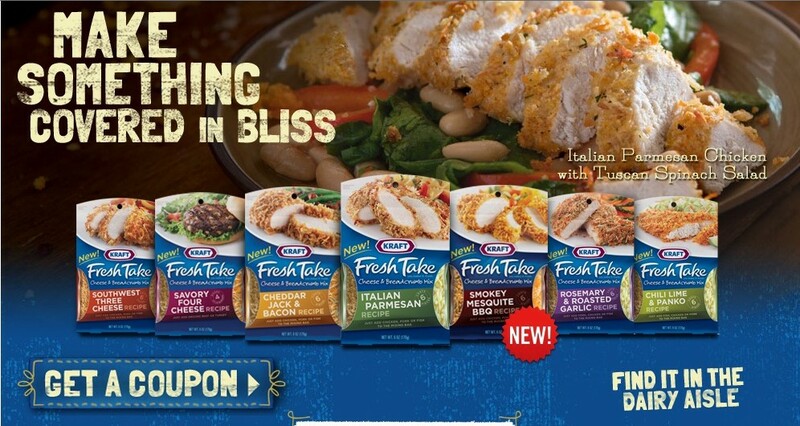 If you haven’t tried a KRAFT Fresh Take Chicken Seasonings, you NEED to. There are SO many flavors to choose from and they’re so quick and easy to use. I love all of the ones I’ve tried: Rosemary & Roasted Garlic, Southwest, Cheddar Jack & Bacon. Want to try the Italian Parmesan next. 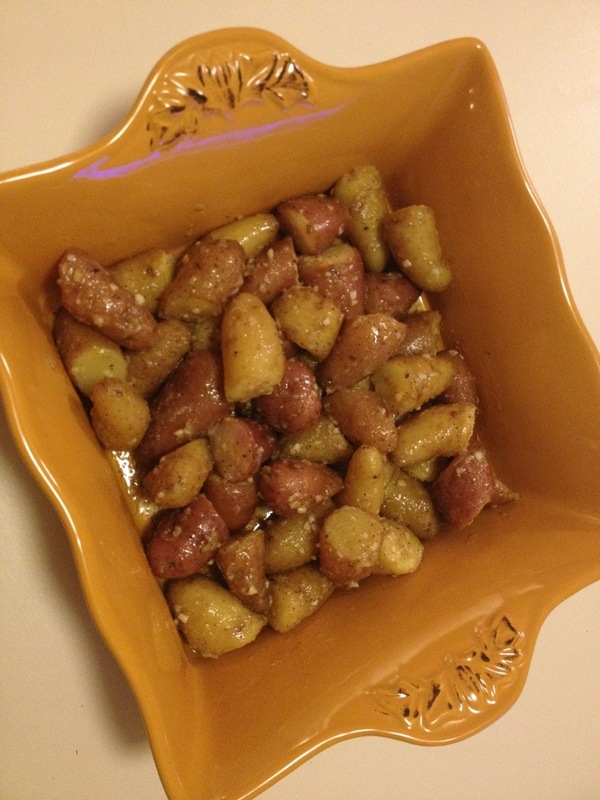 I’ve been searching for a good spice combination for potatoes for a while and these look delicious! Can’t wait to try it out! They’re so good. My mom makes them better than me still though. She cooks them longer and slower I think that might be it… but they are great either way! ENJOY! I’m not changing my story! lol. 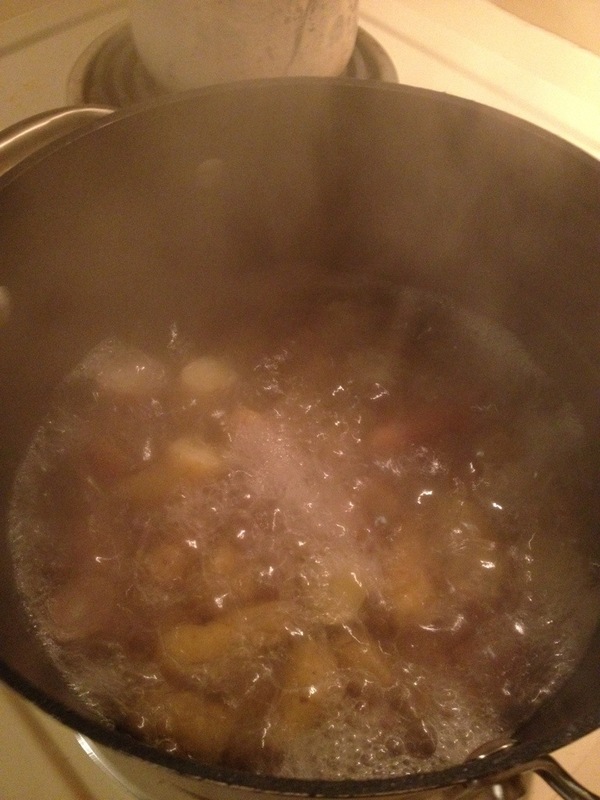 But your potatoes are still better than when i cooked them. you’ll need to come cook them for me again soon! my little TV is so fab, PS. Keeps me company in the kitchen! You have to have carbs, Lindsay. Just make sure you get enough green leafies, yellow & orange (squash),reds (tomatoes, radishes, ?surely more! 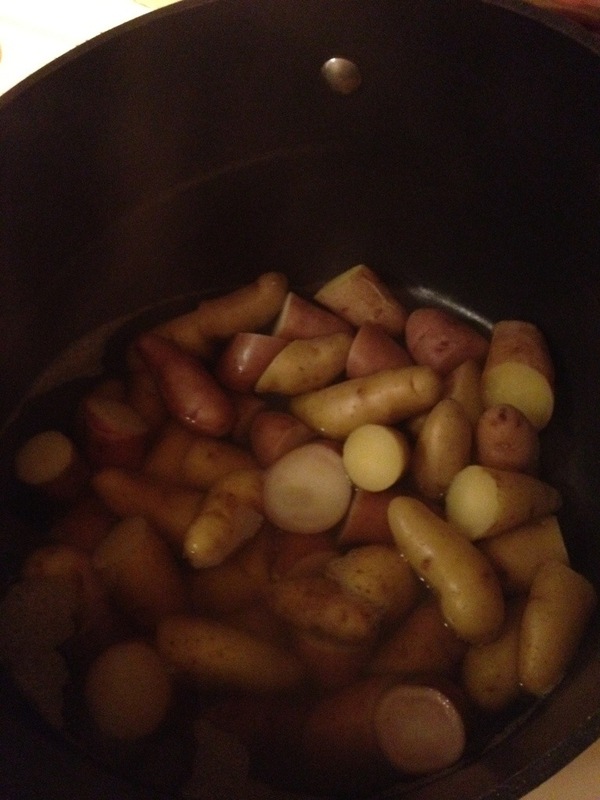 ), purple (red cabbage, eggplant)…mixed in with the fattening whites (potatoes). Throw in some yoghurt and non-gluten grains and you’ll prove The Harvard Study right. It said that nurses who eat potatoes (and I suspect bread) gained weight over the years, increasing heart risk, while those who ate yoghurt will live on and on 🙂 Enjoy. 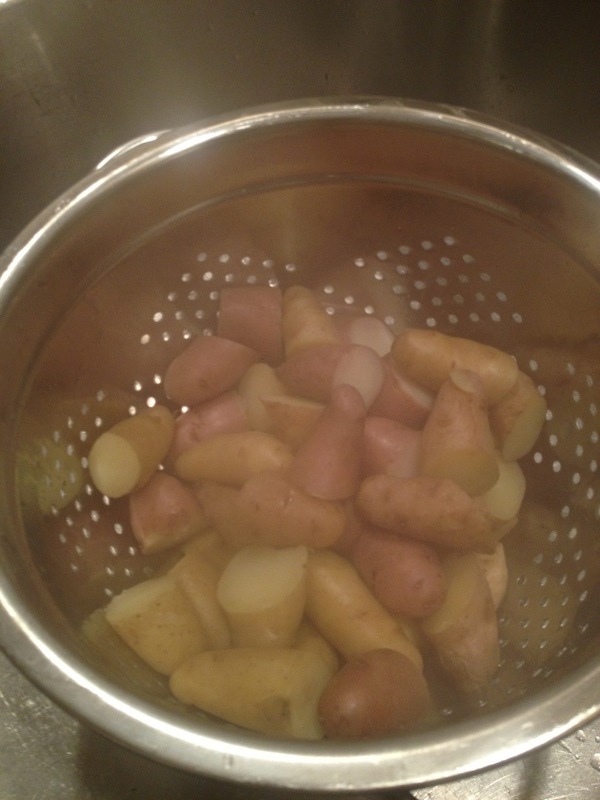 I love these little potatoes; they’re like the ones from the top of the Andes in Peru, where potatoes originated. Fresh take is my FAVORITE! I actually just used the cheese and bacon one last night, it is a stable dinner in this household!